"I have been very clear on the role that Canadians expect of me." Prime Minister Justin Trudeau rises in the House of Commons on June 18, 2018. Prime Minister Justin Trudeau has suggested that it would be "playing politics" for him to condemn the forcible separation of migrant children from their parents at the Mexico-U.S. border. New Democrats pressed Trudeau in question period Monday to suspend Canada's Safe Third Country Agreement with the U.S. due to the "zero tolerance" immigration policy that has seen nearly 2,000 children placed in holding facilities in the U.S. while their parents face prosecution. The practice of removing kids from their parents after illegally crossing the border has been called "unconscionable" by the United Nations high commissioner for human rights. Guy Caron, the NDP's leader in Parliament, blasted the policy as "inhumane" and asked Trudeau if he still believes the U.S. is a safe country for asylum seekers. The prime minister said in French that he would not "play politics" during an extremely difficult situation. While the U.S. remains a safe country, he said, Canada will always do its share to help vulnerable migrants. NDP immigration critic Jenny Kwan charged that U.S. President Donald Trump is using the "cruel and unusual practice" to stop migrants from crossing the border, noting how his administration has scrapped domestic violence and gang violence as grounds for asylum. Again, she asked Trudeau if he still believes the U.S. qualifies as a safe country. The prime minister did not mention Trump in his response and suggested Canadians do not expect him to weigh in on the matter. "From the very beginning I have been very clear on the role that Canadians expect of me — to stand up firmly and unequivocally for our values, for our interests, to protect Canadians and to make sure that we're doing well, as well as having a constructive relationship with the United States," Trudeau said. "That's what we're going to remain focused on." A view of inside U.S. Customs and Border Protection (CBP) detention facility shows children at Rio Grande Valley Centralized Processing Center in Rio Grande City, Texas, U.S., on June 17, 2018. Kwan shot back that Canada risks being complicit in a practice that is destroying lives. "Nearly 2,000 children have been sent to mass detention centres and over 100 of them are under four years old," Kwan said, before again asking if Canada would scrap the Safe Third Country agreement. 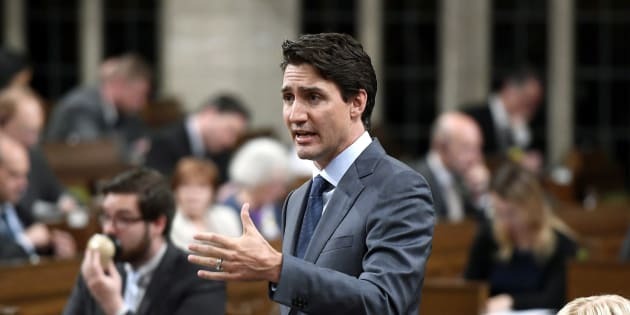 The prime minister said Canadians understand the importance of being "firm and unequivocal" on human rights but cautioned against seeking to score points on the matter. "What we will not do is play politics with this," Trudeau said. Under the Safe Third Country Agreement, which came into effect in 2004, Canada and the U.S. recognize each other as safe places for refugee claimants to seek protection. The agreement requires people to apply for asylum in the first country where they arrive, unless an immediate family member lives in the other country. Canada can turn back would-be refugees at the border on the basis that they must instead make claims in the U.S., where they first arrived. However in what some have called a loophole that has contributed to a surge in irregular crossings, the pact only applies at official border points. The Canadian Press reports that 162 minors were detained or housed with their parents in Canadian immigration holding centres last year. The NDP called on the Trudeau government to suspend the agreement in 2017 after Trump issued a travel ban on several Muslim-majority countries. The party maintains that the U.S. is no longer a safe country for refugees and has repeatedly pressed Trudeau to call out his counterpart in the White House. Trudeau's relationship with Trump hit the skids in recent weeks after the U.S. slapped Canada with steel and aluminum tariffs. Trump has also publicly blasted Canada's supply management system for dairy and poultry as NAFTA talks continue. Canada is planning retaliatory tariffs against the U.S. that will come into effect on July 1. At the end of the G7 summit in Quebec this month, Trudeau told reporters Canadians would not be "pushed around." Trump fired back with tweets calling Trudeau "weak and dishonest," and members of the president's inner circle took to the airwaves to hammer the prime minister with over-the-top language.